Charles Frinks was born on the 26th of October 1904 in Alexandria, Virginia. He grew up on a dairy farm together with his 5 brothers and sisters. At age 21 he married 17 year old Faye Purvis. With her he had 2 children, Charles and Jean. In 1940 the Frinks family moved to Lansdowne, PA. Charles had a job at a nearby navy base. He worked there untill America entered the war. He enlisted to the army and received his basic-training at Ft. Leonard Wood, MO. 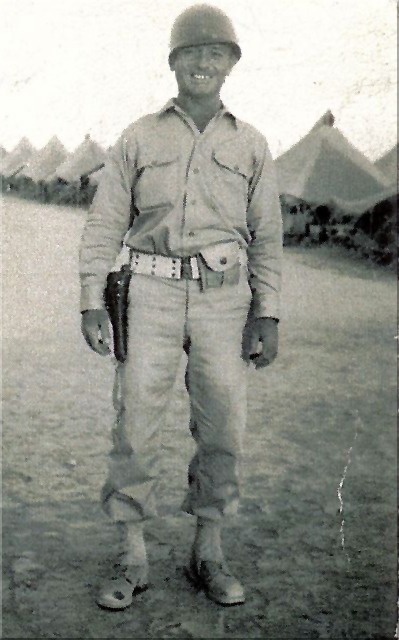 After basic-training he was assigned to the 8th Reconnaissance Troop, 8th Infantry Division. In 1943 his unit was transferred to the 11th Cavalry Group and re-designated as the 44th Cavalry Mechanized Reconnaissance Squadron. Picture of PVT. Charles O. Frinks at training in Arizona. On November 23, 1944 the 44th Cavalry Recon Sq. landed at the Normandy shores and moved to the Rhineland area. The first assignment was to begin aggressive patrols across the Roer River to check enemy movements. For this they bivouaced at the city of Heerlen, the Netherlands, for a while. In Heerlen he met the family Gulikers, the family of Charles would stay in contact with this family after the war. Left-to-right: Charles Frinks, Mr.Gulikers, Mrs.Gulikers, unknown. 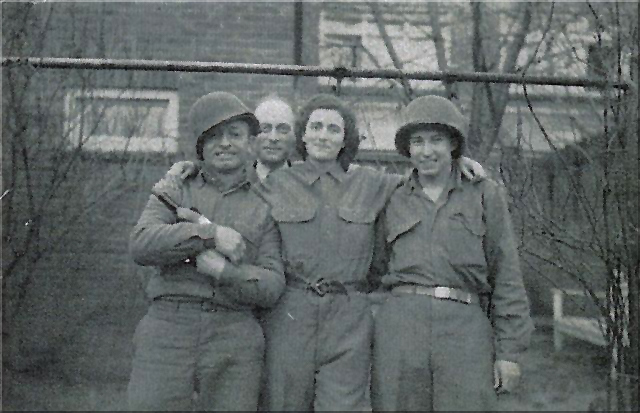 When the Allied offensive resumed after the Battle of the Bulge, the 44th Cavalry Recon Sq. was tasked with covering the flank of XIII Corps during the push from the Roer to the Rhine. Constantly in contact with the enemy, the 11th Cavalry hit the Rhine River on 5 March 1945, having inflicted 487 casualties while taking only 56 themselves. Crossing into the German heartland on 1 April, the 11th Cavalry resumed a flanking screen for XIII Corps. Pushing ahead, virtually cut off from other friendly units and supplies, the 11th scored bold victories as they liberated more than one thousand American POW’s along with several thousand slave-labors from a prison camps. The 11th Cavalry pushed on to the Elbe River, reaching it on 14 April. The 11th cavalry "Black Horse" was constituted on the 2nd of February 1901 in Fort Myer, Virginia. It was meant to be a part of America's new army after the Spanish war. Almost immediately after activation the 11th cavalry was send to the Phillipines to put down the insurrection. After returning to the US, 2 squadrons were send to Cuba to boldly assert American presence. In 1916 the 11th Cavalry took part in General Pershings punitive expidition to Mexico. In Mexico the unit earned it's fame by fighting in heroic battles, like the liberation of the 10th cavalry at Carrozal and by conducting the last mounted cavalry charge in American history on the 5th of May, 1916, while pursuing Pancho Villa's rebel army across Mexico. The next years were years of re-organisations and eperimenting with mechanized vehicules. On the 15th of July 1942 the 11th cavalry group was in-activated to be re-activated on the 5th of May 1943, this time without horses, but mechanized. In this form it fought in WW2 in the Normandy, Rhineland, Ardennes and central-Europe campaigns. After WW2 the unit stayed in Germany as Constabulary Regiment. For this purpose they temporarely got horses again. Later the 11th cavalry served in Vietnam and Cambodia, in Germany during the cold war and in Kuwait after the Gulf war. Now the unit is designated as a trainingunit at Fort Irwin, California. On April 17, 1945 the 11th cavalry was doing a mop-up mission in the vicinity of Salzwedel. Pvt. 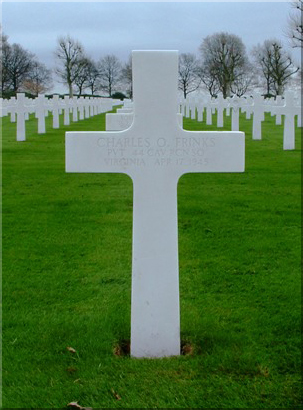 Charles Frinks was on his way to a guardpost in a jeep when he was killed by a sniper's bullet. 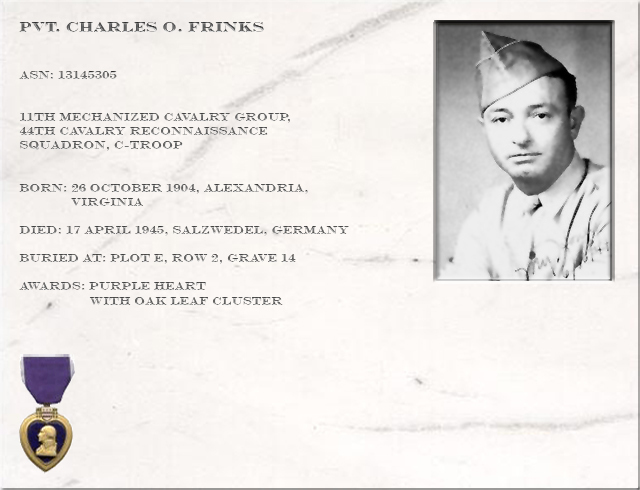 On April 10, 1945 Charles Frinks was wounded, for which he received a purple heart on April 13. On April 16 he send the medal and a letter to his wife Faye in the US, closing the letter with:"Will meet you again at the spring". The next day he died. 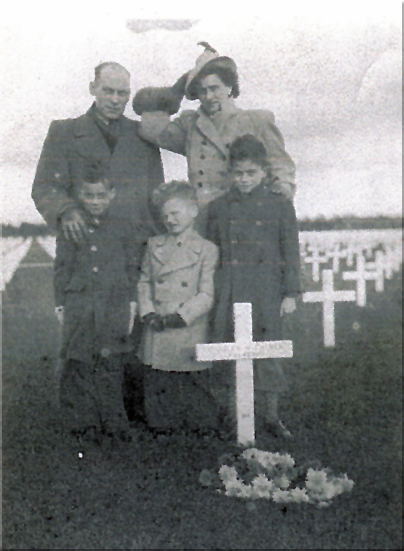 Family Gulikers from Heerlen at the grave of Charles Frinks in 1946. 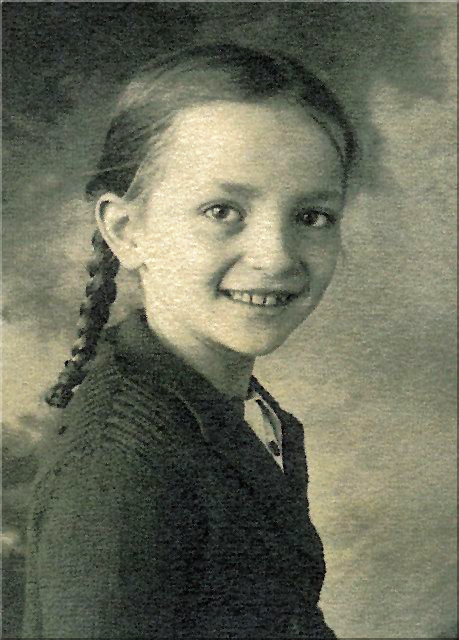 Picture of Jean Frinks, daughter of Charles Frinks at the age of 10. This picture was found in Charles' wallet when it was returned to his wife Faye.